GHD Styler// Hairtrade. Bag// & Other Stories. Shoes// Zara. Trench// H&M. Shirt// Uniqlo. Knit// Boohoo. Skirt// Boohoo. GHD; every girls favourite hair straightener have took to the trends to makeover their classic slim line IV styler in some of ss14's sweetest pastel shades. 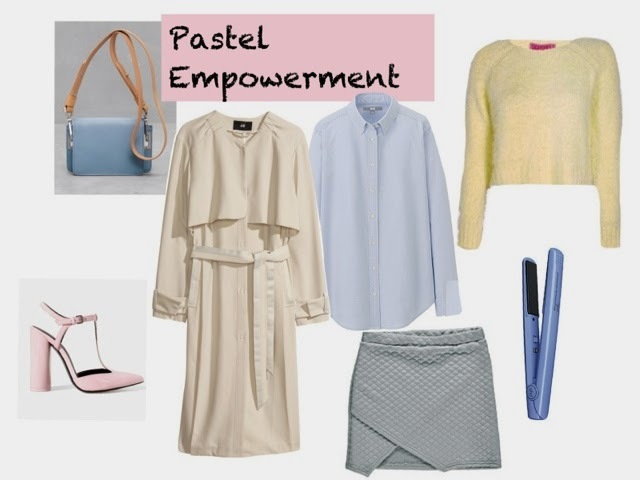 I felt inspired by the periwinkle so I put together an outfit that would be polished off beautifully with glossy waves! Hairtrade are selling the Jade and Lavender versions too at a discounted price so you may feel inspired yourself to update your hair care as well as your wardrobe this season.